Coach cleaned up the house for Mother's day. 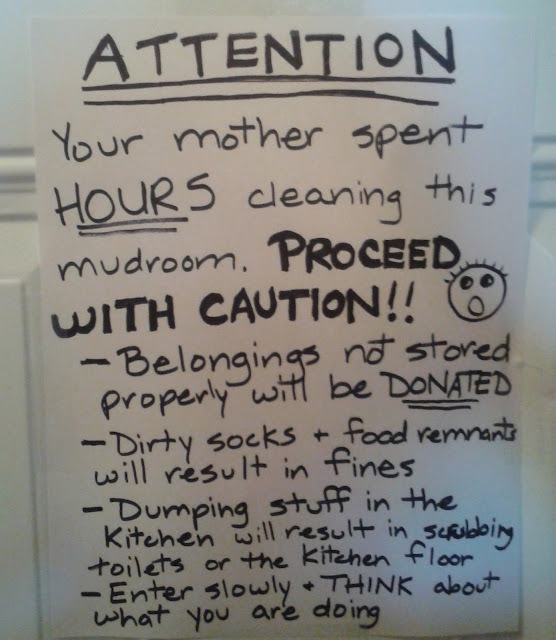 I had been in St. Louis with three kids for an Irish music competition, and I completely appreciated the cleared counter tops, swept floor, and uncluttered mudroom when I returned that day. A few weeks later I tackled the mudroom full force. 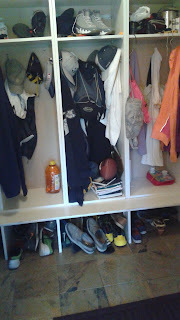 Coach's approach to the mudroom is to tell the kids to get in there and clean out their lockers. Of course the kids can tell you that they've handled it. As parents, it is our job NOT to believe them. The floor of the mudroom might even be clear of huge heaps of shoes and backpacks after the kids have 'organized' their stuff. It's a smoke screen though. Shortly after Mother's Day the library alerted me that a book Mini had checked out months prior had yet to be returned. I urged my avid reader to search the house before I ended up having to buy the book. She swore up and down that she had never seen the book. It was in her locker. So, riddle me this . . . how does a book you've never seen appear in your locker if you have recently cleaned out said locker per your father's request? The hours I spent in our mudroom in early June when I chose to adopt organizing this space as my sole mission in life yielded some interesting finds. I uncovered rotting food in abandoned lunch boxes. I discovered missing shoes presumed lost forever. I matched gloves and stored them away till next winter. I sifted thru piles of winter layers - donating unnecessary sizes and stuffing the rest in our cedar chest . . . since it was now JUNE!!! I filled a laundry basket with forgotten workout clothes - some still jammed into drawstring bags. Small room makes it hard to get a photo of all 6 lockers. This is the finished product. Sadly, it's temporary. Oh, the basketball shoes and sneakers. 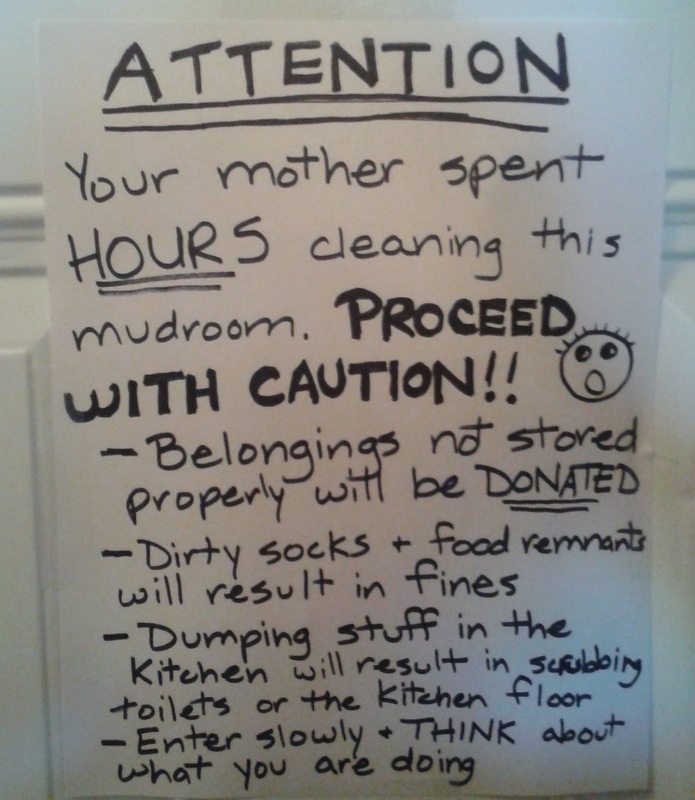 I begged my male teenage offspring to fess up. What shoes do they not wear anymore? I redistributed and eliminated a few pairs. 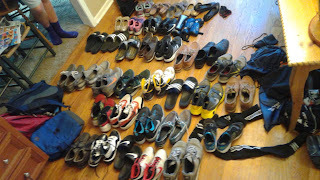 Thanks to my Sasquatch-like children, their shoes take up an incredible amount of real estate. When we designed the space, I specifically insisted that the lockers NOT include any kind of drawer or cabinet door associated with shoe storage. 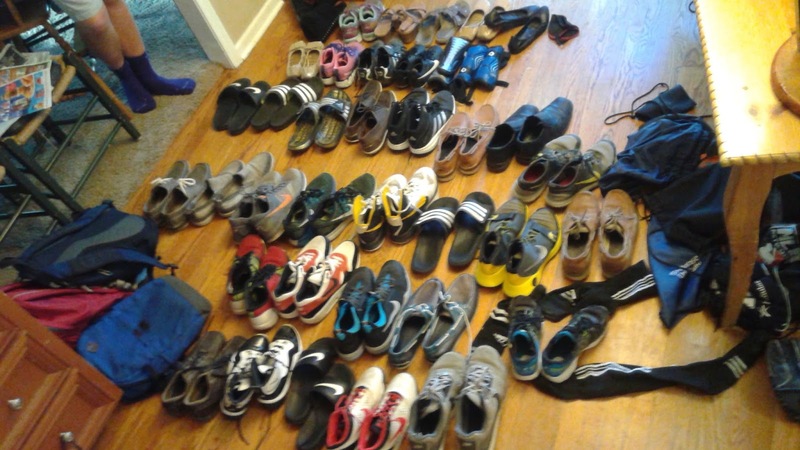 I knew that any additional step to storing their shoes would only end in piles of shoes in the middle of the room. Even with an open cubbie under each locker, they struggle to kick their steppers into the proper place. The mudroom is only about 5 feet by 7 feet. It's easy to lose things in this space - like library books, non-existent swim diapers, and my sanity. 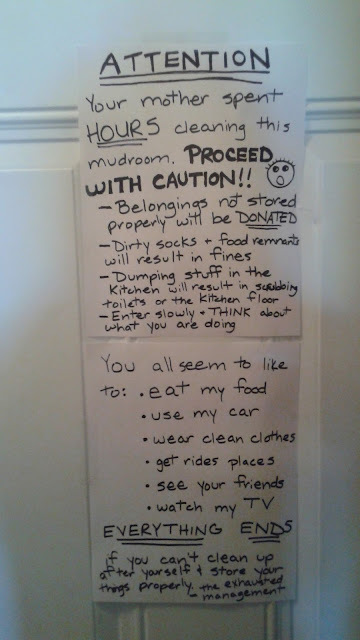 In hopes of maintaining some level of order - for at least the next few weeks, I posted a warning. I doubt it will help, but they've been warned! The full message - it's been weeks and no one has ripped it down. A closer view of the first half. A closer look - bottom half of the message. 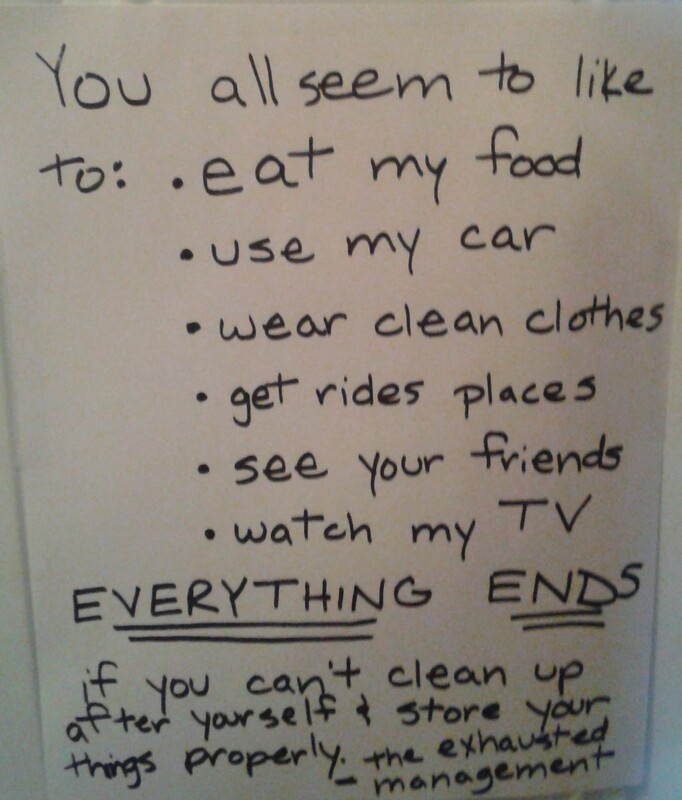 Good for you, mom!! Now...although the list hasn't been ripped down, have the rules been followed?